To download The Atomic Dashboard from the Mac App Store, you need a Mac with OS X 10.6.6 or later. Learn More. 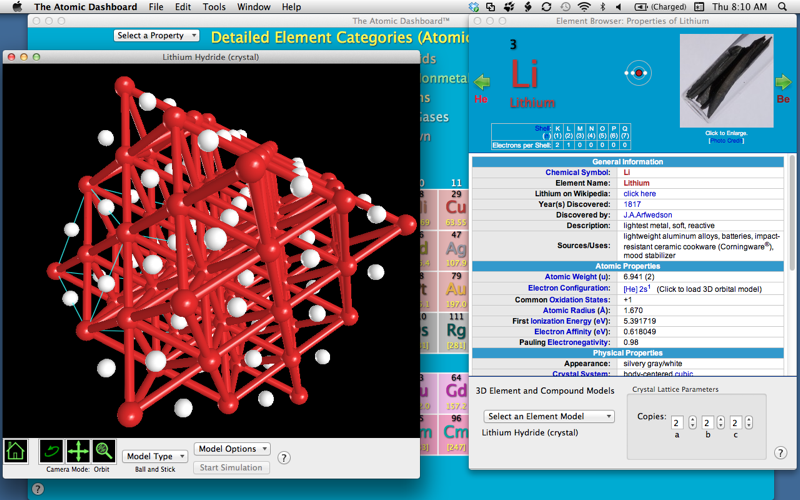 The Atomic Dashboard is an interactive chemistry resource and learning tool developed by Bitwixt Software Systems. Used by educators, students, scientists, and the simply curious, The Atomic Dashboard features an interactive periodic table that lets you explore the chemical elements -- their properties, periodic trends, history, and relevance to society. And more exciting, with its new 3D Molecule Library and its physics-based, 3D models of atomic orbitals, molecules, compounds, gases, and crystals, you can explore the relationships between the behavior of atoms and molecules and their 3D structure. Nearly 150 years ago, the distinguished Russian chemist Dmitri Mendeleev discovered previously hidden relationships between the physical and chemical properties of the elements and their atomic weights. Ordering pieces of paper representing the elements into a two-dimensional grid -- a table -- he grouped together elements with similar properties. Thus was born the periodic table. Over the years, as the periodic table was expanded, it revealed the organizing principles of matter. In fundamental ways, it contains all of chemistry -- in ways that even Mendeleev could never have dreamed. Master its secrets and you're on your way to mastering chemistry. Yet, for much of that time the periodic table has remained lifeless -- a collection of boxes mounted on the walls of desolate lecture halls and on the inside covers of musty textbooks. Now you can also use The Atomic Dashboard to find, download and view interesting molecules from a collection of 25 million 3D models available in the PubChem database at the U.S. National Institutes of Health. • Search the PubChem database by molecule name, by chemical formula, or by searching for terms as wide ranging as "vitamins," "hydrocarbons," or "detergents." 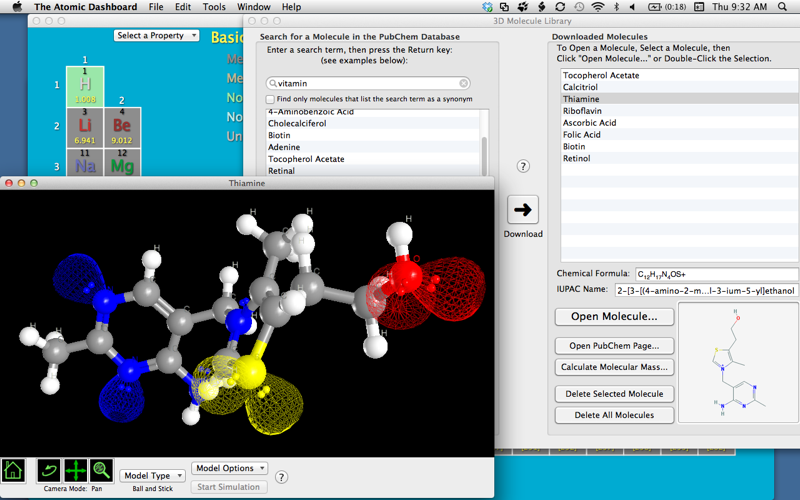 Download these molecules and inspect them using the unique 3D viewing tools in The Atomic Dashboard's Model Window. • Explore the bonding characteristics of molecules, including the covalent bonding structure ("3D Lewis structures") and the locations of lone pair electrons. • If you're taking organic chemistry, zoom in and examine the 3D features of organic molecules that are so important to reaction mechanisms. • Calculate the molecular mass and percent composition of the elements that make up a molecule by entering its chemical formula. 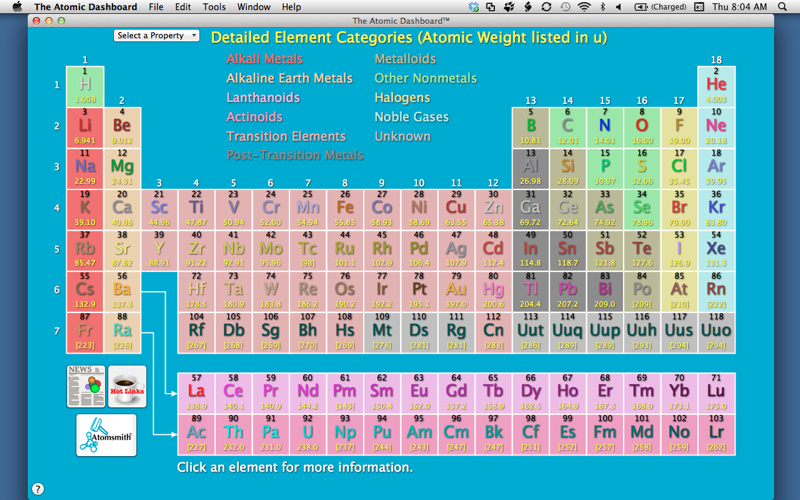 The Atomic Dashboard's user interface is dead simple -- it's the periodic table. 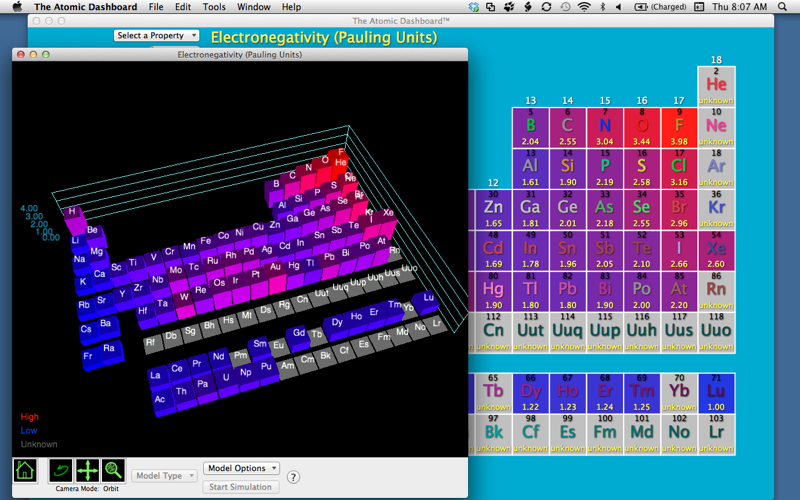 And as you navigate The Atomic Dashboard, you are also navigating the principles of chemistry. • Search for interesting molecules from a collection of 25 million 3D models available from the PubChem database at the U.S. National Institutes of Health. Search the PubChem database by by molecule name, by chemical formula, or by just searching for terms as wide ranging as "vitamins," "hydrocarbons," or "detergents." 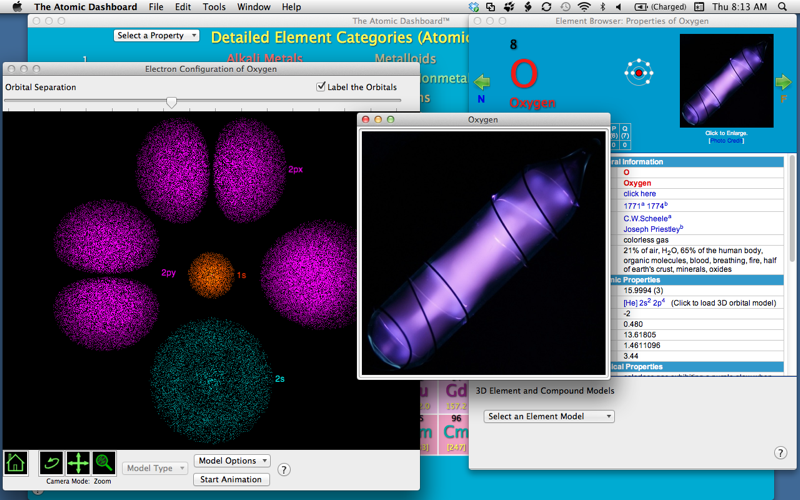 Download these molecules and inspect them using the unique 3D viewing tools in The Atomic Dashboard's Model Window. • Explore the bonding characteristics of molecules, including their covalent bonding structure ("3D Lewis Structure") and the locations of lone pair electrons. If you're taking organic chemistry, zoom in and examine the 3D features of organic molecules that are so important to reaction mechanisms. • Calculate the molecular mass and percent composition of elements that make up a molecule by entering its chemical formula, e.g., CH3CO. • Atomic Labels -- Displays characters on each atom that represent its atomic symbol or its atomic number. • Bond Pairs Model Type -- Represents bonds as pairs of small spheres representing the shared electron pairs in covalent bonds. This representation, along with the display of lone pairs can be thought of as a "3D Lewis Structure." • Lone Pairs -- Displays a pair of small spheres for each set of lone pair electrons, and/or a thin mesh representing the "lobes" of electron density where the lone pairs are located. • Orbital Color Selection -- The "clouds" of dots that represent the orbitals can now be colored in one of two ways. The first option is to color each orbital by its type, e.g. 1s, 2s, 2p, etc. The second option is to color code each orbital dot by the sign of the orbital wavefunction at that point -- with red dots representing positive values and blue dots representing negative values. • Background Color -- Sets the Model Window's background color -- some models display better on a lighter background. For example, the display of orbitals when using an LCD projector typically exhibits the most contrast on a white background. • The Help System now provides more detail, direct access to Help resources from all program windows, and easy navigation between topics. This app does OK, but what would be helpful especially for the search mode in the 3D models would be a toolbar or even a button to do sub numbers. Occasionally the search doesn't recognize numbers in line with the letters as sub numbers. Ex. Formaldehyde CH2O is not recognized when you type in CH2O, but when Formaldehyde is input it is recognized. only thing keeping from 5 star review. Another thing that would be helpful is chemical equation balanching feature. overall a solid app for a college student even getting into upper level Chem classes.